If you've ever grown daylilies, you're probably familiar with what a great plant they are. They have to be one of the easiest plants available — hardy perennials that require little maintenance and have almost no problems from pest or disease. And, of course, there is an incredible variety to choose from! Blooms in almost any color, in sizes from 2" to 10" and in a variety of shapes — perfectly round, to spiders to doubles. Useful as both specimens and mass plantings, there is a spot in every garden for a daylily. Daylilies are among the most carefree and easy-to-grow perennials. They are very tolerant of a wide range of conditions, and are very forgiving of gardening "mistakes." But it really pays to give your daylilies the best growing conditions possible. They will respond accordingly. Use the information below to help you plan for your new daylilies. Complete planting information is included with every order. And always, if you have questions or concerns, please call us (1-865-687-3770) or write us. We want you to be successful and happy growing daylilies. Sun: Daylilies love sun, full sun if possible, but will tolerate part-shade conditions. A general rule is to make sure they get at least 6 hours of direct sun a day. Many darker colored varieties will benefit from partial shade in the hottest part of the day. Soils: Daylilies will grow in a wide range of soils, from sand to heavy clay, and in a wide range of soil pHs. There are steps you can take to improve your soil, especially if it is predominantly clay or sand. Clay soils can be improved by the addition of compost, humus or peat moss, or sand which will help make it more friable. Sandy soil will benefit from the addition of compost, humus or peat moss which will serve to increase water retention. Drainage: Daylilies prefer well-drained soil. In problem areas, one way to achieve adequate drainage is to prepare raised beds. Other plants: To avoid root competition for water and nutrients, do not plant daylilies near shrubs or trees if possible. If you can't avoid it, be sure to give them extra water and fertilizer to make up for what the other plants take. An exception is in the South, where daylilies perform well under pine trees, benefiting from their dappled shade. Spring or Fall planting is recommended, especially in hot areas. Spring shipments should arrive after the ground has thawed and danger of hard frost has passed. Fall shipments should arrive several weeks before freezing weather, although you can plant later if you will mulch the plants. Work your ground in advance, incorporating organic material such as compost or well-rotted manure if possible. Small Flower & Miniatures: 16" to 24"
Large Flowers: 18" to 30"
For a closer bed or border: 12" to 18"Some varieties increase very rapidly and will become crowded over time, sooner the closed you plant them. If you notice a decrease in blooms because of crowding you will want to divide your daylilies. Water: Water is essential for good performance. In sufficient quantity, water helps ensure that you get as many blooms and as large blooms as possible. It is most important that daylilies get sufficient water in the spring, when plants are making scapes and buds, and in summer during bloom season. Daylilies can withstand drought conditions, but you will notice decreased numbers of blooms and smaller bloom sizes. A general rule is to try and give your daylilies an inch of water every week - 3 or 4 long waterings to let the water soak in deep. Fertilizer: What kind of fertilizer? Because each garden has different soils with different nutrient needs, we hesitate to recommend a specific fertilizer for you to use on your daylilies. In general, though, daylilies are not picky about their fertilizer, and for most home gardeners a complete balanced fertilizer such as 6-12-12 or 10-10-10 will do fine. When to apply? Wait until your newly planted daylilies are established, two to three weeks, before you fertilize them. Then a single application in the spring is sufficient for most gardens, although some gardeners choose to fertilize again in the late summer or early fall. Mulch: Mulching can be beneficial to your daylilies in several ways. It can help by improving your soil through the addition of organic material, by helping to retain moisture, and by helping to discourage weeds. It can also help keep soil cooler in the winter. There are good mulching materials you can use depending on what is available in your area. Wood chips, straw and pine needles are just a few possibilities. Grooming: Many daylily growers remove the day's bloom at the end of the day, called dead-heading, to give their gardens a neat appearance. In winter in cold areas, feel free to remove the dead foliage, but realize that you are removing the plant's natural cold-insulator and replace it with mulch if possible. Weed Control: There are no easy answers to weeds, as any gardener knows. Daylilies are good at keeping weeds down once they are established, but until then, mulch and hoeing are good weed-control methods. There are various herbicides available for use around daylilies, check with your local garden center or call us for more information. 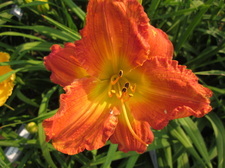 Pests: Luckily, daylilies are not very susceptible to pests, and those that do bother them normally do only minor damage. Some of the more common pests are aphids, spider mites, thrips and slugs and snails. These pests may cause bumps on the buds, discolored leaves, bent or twisted scapes and ragged edges and holes on the foliage. It is often difficult to tell what exactly is bothering your plant, and you may want to check with your local agricultural agent and have him test to determine the cause. In the case of aphids or thrips, there are several sprays readily available at your local garden center or home warehouse store. Because of their low maintenance and because they do come back year after year, daylilies make great additions to any landscape. Use them as ground covers, to hold banks, as borders along fences and walks, and in decorative beds throughout the landscape. They also make attractive containerized displays. Groupings: For the greatest impact in the landscape, plant your daylilies in groups of the same variety. Season of color: By selecting daylilies that bloom and rebloom during different times of the season, you can extend your color. Tetraploids and Diploids: These terms designate whether a variety has eleven pairs of chromosomes (diploids) or twice as many (tetraploids). If you want to hybridize, you must cross diploids with diploids and tetraploids with tetraploids. On this website and in our catalogs, tetraploids are marked with an asterisk (*). Dormants and Evergreens: Daylilies vary from dormant varieties (the leaves die completely to the ground in the winter) to evergreen varieties (the leaves try to grow whenever it gets warm) with various degrees of semi-evergreens in between. Gardeners from USDA zones 9 and 10, and other areas that do not have a cold period in the winter should buy only evergreen or semi-evergreen varieties. Northern gardeners in zones 4 or colder may want to stick with dormant varieties, although many semi-evergreen and evergreen varieties will grow well, especially if mulched. One other note: in zones 7/8 and colder, the foliage will typically be frozen to the ground regardless of foliage type. Join the AHS: For more information about daylilies, consider joining the American Hemerocallis Society. Members receive quarterly issues of The Daylily Journal which contains many useful articles about daylily care and other daylily-related topics. Members also have access to other publications, videos, and slides and are invited to attend the Society's annual National Convention. rebloom: Varieties may have more than one set of bloom scapes, either one right after another or with a break in between. Southern gardeners can expect more rebloom because of their longer season.